If No One is Home to See the Soufflé, Did It Still Rise? That was such a nice soufflé, by the way. Ham and cheese I think. 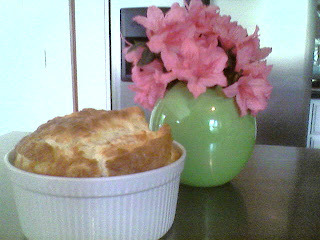 And I made the flower arrangement because taking a picture of a soufflé seemed so seventies cookbook. The green vase is a nice touch, n'est-ce pas?